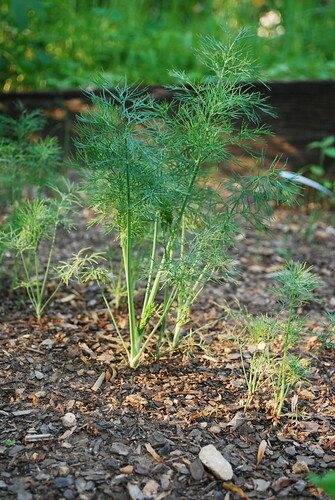 I wanted to post some pictures of my herb garden, since it is officially thriving. I have some space on one side that I want to fill with a couple of different types of herbs, but I have not decided what I want to plant there yet. 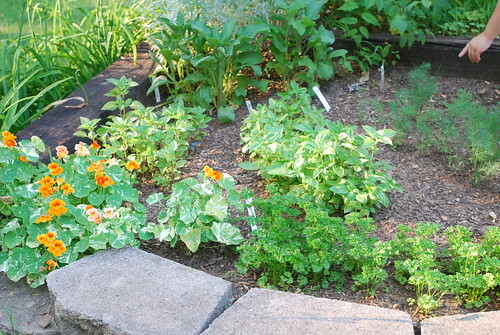 I would like to plant some thyme, oregano, and cilantro. I need to do a little research a make sure this combination works ok together. 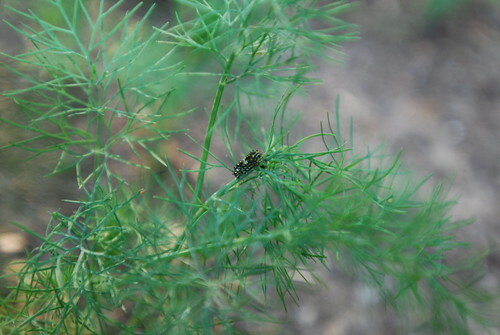 Caterpillars love my dill plant. 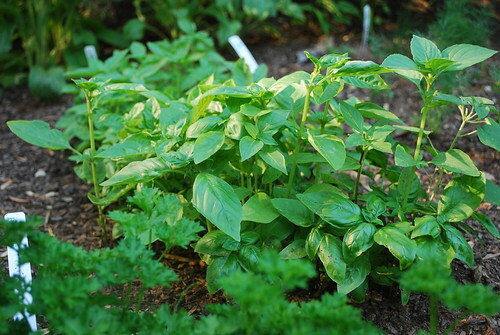 I will probably use the basil the most so I am glad that I have tons of it. The nasturtium is flowering. It has really taken off. The dill still looks a little puny, but it's growing. So that's good. The chives are not doing great. It could be because while "helping" me pick weeds my daughter plucked about half of it out. It does look like grass so you can't blame her too much. The borage is growing well along with the parsley. We have had a good amount of rain and that has helped immensely. I have never been known for having a green thumb, so I feel like this little garden is a huge accomplishment. It gives me hope that I might actually be able to plant a vegetable garden next year. I also wanted to thank Jaimee for telling me how to post pictures using flickr. What a difference. I knew that I could upload to flickr, but did not know what to do after that. Thanks Jaimee. How cool! It looks really pretty too. I have thought about venturing out and doing a veggie garden. I think I am too lazy though. I hear it takes lots of work....Good luck with your herbs! The garden looks great. Enjoy walking into your backyard and grabbing a handfull of anything you like. Also, I tagged you on my post today http://greenandnaturalmommy.blogspot.com/2008/06/dont-hate-me-because-im-not-green.html . Your garden looks great! You can definately never have too much basil (if only i lived somewhere warm enough to grow it!!) 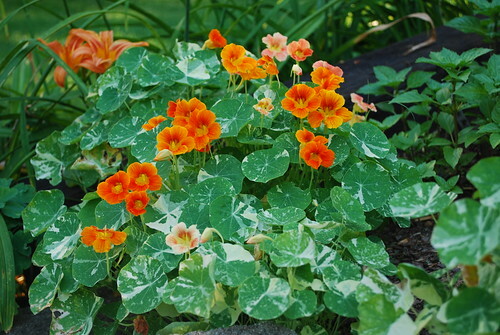 and nasturtiums are my fav plant - i am a somewhat intermittant gardner and nasturtiums are wonderful for hiding the neglect and keping things looking cheerful! !